Wow, I had never met Meng “over the top” La before, but he was seated just to my left on Day Three and, believe me, this guy made Stu Ungar look like a slow player! Meng proceeded to raise or re-raise like a mad man over the course of the day. He raised, re-raised, or moved all-in almost twenty times in the first two hours. This guy never folded his hand once he put a chip in! How he survived that first two days playing that fast is a mystery to me. Usually, when someone plays that fast against me, I bust them by about the fifth move-in. Be that as it may, I felt sure I’d bust Meng eventually; all I needed was time. He was a thorn in my side, but eventually his chips would fit nicely in my stack. Despite the fact that I felt like I’d been victim to a Meng onslaught, I still had $117,000 with sixty players left when this monster hand came up. While I was focused on the Meng La show, a new player I had never seen before, Robert Varkonyi, came to our table and slipped into a seat. I pretended like I didn’t notice him while I table-talked with Meng, but immediately I had a good read on him. Reading people is my biggest strength in poker. With the blinds at $1,200-$2,400 and the antes at $400 a player, Robert raised the pot to $8,000 to go, and I looked down at my pocket cards: Ah-Kh. All in! I asked for a count, and it turned out that he had $81,400 in front of him. 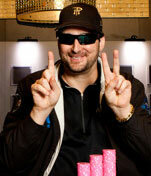 With $56,000 already in the pot, I had a decision to make, but my mind kept screaming, “He has nothing! You have to call because you know you have the best hand! !” It was almost as if I really did “know” that he had nothing, and part of my mind said, “Now is the time. You’re holding A-K suited, Phil!” After less than a minute I called, and he flipped up Qc-10c… as if he was proud of his hand!! For three grueling, studious days, I had avoided playing a big money pot, and now I was only a three-t0-two favorite for the money here. So this is how it fell: the flop came A-Q-10, obviously giving Robert two pairs to dominate my Ah-Kh. The turn and the river were rags that did nothing for either of us, so Robert held his lead and won the hand. So here’s the final analysis: my call was a little weak because I still could have won the tourney easily had I not made it (because I had $93,000), whereas, by losing the pot to Robert, I was knocked so far back that my Main Event dreams were virtually extinguished. That’s the killer, playing impeccable poker for three days straight (so exhausting!) and getting knocked out with A-K suited. Welcome to the game of poker. But where do you draw the line?! Do you fold when you feel you’re the favorite and your opponent is weak? Maybe I could have folded back then, but in the 2010 WSOP Main Event I would make that call every time I felt weakness, because nowadays you need to win several all-in pots to win the tournament. Honestly, I don’t like Robert’s play here at all. Why would he risk all of his money with no hand, against someone who is known for reading players well? Why not wait a mere ten minutes for a better hand or a better spot? 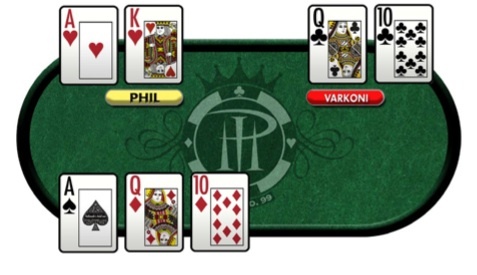 To me, he had an easy fold, and not only did he enter the pot… he moved all in! However, it is now well-known that Robert — his chip stack now enhanced with my chips too — played out the tournament pretty well that year (2002) and went on to win the whole thing and $2 million. Congrats, Robert!